As for the cast of season two, there is no shortage of familiar names here - we have Mary Lynn Rajskub (Chloe from 24, looking better than ever), T-Pain, Moby, Sugar Ray (Mark McGrath), DMC from Run-DMC, Kyle Glass, and others. Each episode is about 4-5 minutes, so clear about half an hour on your schedule - it'll be worth it, I promise. I was hooked after the first minute. And now, let's watch, shall we? No fact is too trivial and no celebrity is too big for the Fact Checkers Unit! Check out the debut episode as the duo is sent away from the office party on an 'impossible' fact mission. Plus, watch a cameo from Moby! In this week's episode of Fact Checkers Unit, the team checks a fact about T-Pain, and end up recording a track with his twin brother, Pete Pain! Watch FCU dive into the world of hip hop with help from Mark McGrath and Samsung GALAXY Note. Is Kyle Gass segueing across the country? This week's episode of Fact Checkers Unit involves Kyle Gass from Tenacious D, a Segway, and the FCU stranded in the desert! You don't want to miss it! Watch FCU overcome the desert to discover the truth with Samsung GALAXY Note. Does DMC (from Run-DMC) really think he is a king? 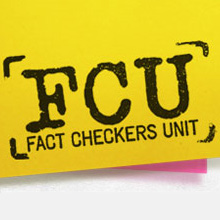 The FCU finds out in this week's Fact Checkers Unit episode as their friendship gets tested to the limits. Watch FCU break into a castle to find out with Samsung GALAXY Note. With a guest appearance from Mary Lynn Rajskub. Catch the final episode of the Fact Checkers Unit as the duo check facts for the last time and face their toughest adversary yet... themselves. Watch to find out if FCU and Samsung GALAXY Note make it back to the office party in time. With a guest appearance from Mary Lynn Rajskub. FCU probably has the highest production value of any semi-promotional videos of a mobile device I've seen in a long time, possibly ever. Bravo, Samsung, et al. Keep it up - I'd love to see more videos in a similar vein in the future.